There is no denying that Beyonce has a great canvas to begin with , we've seen her without a drop of makeup on and she looks even more radiant than she does in full on glam. In a recent interview with The Cut (Nymag.com) Sir John , (Celebrity and Editorial Makeup Artist as well as the newly appointed Celebrity Makeup Artist / Ambassador for L'Oreal Paris ) gave a insider tip to obtaining a great glow. Sir John mentioned that we can use Eye Cream beyond the eyes, and use it on the entire face. "I'm a skin-care junkie. I like to use eye creams around the face. I also like to use face creams on the body. I approach the body from head to toe as if the whole body will be seen. Most women concern themselves only with the area from hairline to the chin. It's not about that. It's about bringing the conversation of skin care into the décolleté, onto your back, and into your legs." said Sir John . Three options I like are 1. Volante Skincare Transformative Eye Creme ($85) , 2. Tarte maracuja c-brighter eye treatment ($38) , and lastly 3. Burt's Bees Brightening Eye Treatment ($20). I've used all three of these eye creams personally , recently covered the Volante I have been satisfied with the results of all three. "But get your skin into good condition; drink kale. Kale is very high in vitamin K and it increases circulation and helps cell turnover. If you approach your makeup with a holistic approach to health, everything else seems a bit easier. " 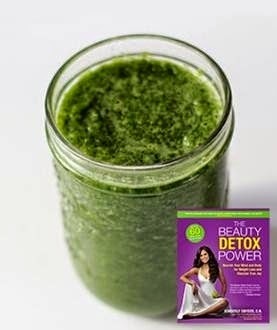 You can also check out the new book The Beauty Detox Power , by Kimberly Snyder ( $19/Amazon) for great recipes ( that go beyond just the use of Kale) to rejuvenate from within to get that glowing radiant skin. Remember : SKIN is IN . Happy Friday + Get Glowing ! !